One of the important operations in the activated sludge processes is liquid-solid separation. Because of differ ences in material characteristics, models for primary and secondary settlers are different. The secondary settler separates the biomass from the treated wastewater, a key mechanism determining the quality of the effluent since biomass in the effluent affects both the water clarity and oxygen demand. Consequently, more research emphasis is placed on the secondary settlers than primary ones. 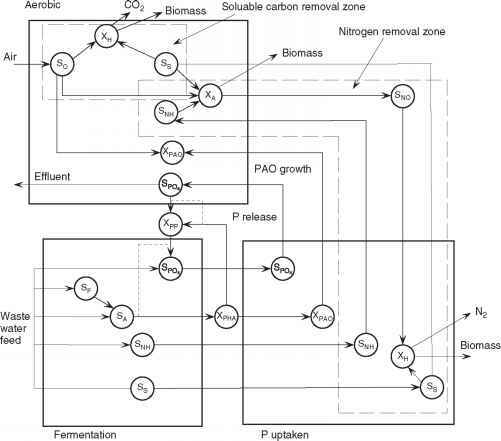 Figure 6 Nutrient removal mechanisms in activated sludge processes. the other flowing downwards and being withdrawn at the bottom. The biomass concentration varies with height in the settler as well as with time. This makes the settler a distrib uted parameter system (DPS) described by PDEs, and leads to quite complicated mathematical models. Another key feature of the settler modeling is the flux model for the solid settlement. Two commonly adopted models are the compartment model and multilayer model, which are shown in Figure 8. In the compartment model, a settler is divided into two compartments, namely clear water compartment and sludge compartment. Two sets of differential algebraic equations (DAEs) are developed to describe the dynamics of sludge hold ups in the two compartments, suspended solid concentration in the overflow stream, and sludge blanket concentration in the sludge compartment. The multilayer model is obtained through discretization of PDS models represented by PDEs using a finite difference method. In the multilayer model, the settler is divided into n layers as shown in the bottom diagram in Figure 8. The value of n may vary from 10 to 100. Obviously, the multilayer model provides more accurate prediction of the settler dynamics than the compartment model but at the price of more complicated mathematical representations and much longer computing time. Figure 8 Compartment and multilayer models for secondary settlers.